Hiring a freelancer is easy if you are aware of specific rules which can ease your job and save a significant amount of time. One of the fundamental rules which apply to all kinds of freelance work is, discussing the requirement without missing a point. This step may seem unimportant to most clients and freelancers as well; but, this is the foundation of every project. For instance, as a client, you have mentioned every acute detail about the project while posting it, but there are chances that the freelancer you chose may miss some of the parts while working on it. How can you expect an exceptional output if you mess up with input? Firstly, include discussion of the requirement before the project begins, as this will not only give more clarity and save time but also make the freelancer realize that the project is important to you. It will make them prioritize your work to provide the best results. 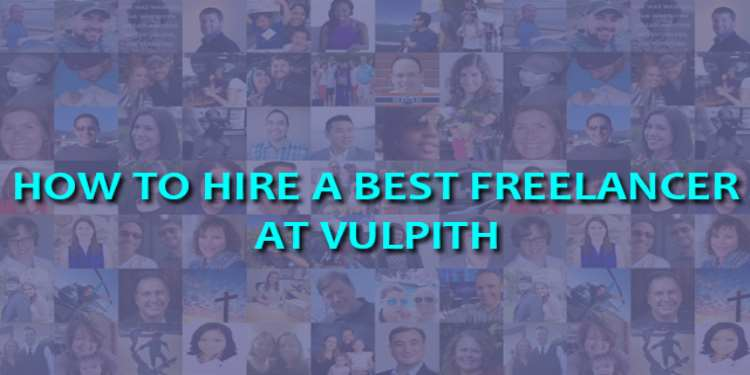 Secondly, unlike other freelance sites, Vulpith has provisions for freelancers to choose their specialization in an elegant manner rather than just being generic. This helps the freelancer to get the projects which genuinely keep them interested while working, and the clients get hold of the right person to brainstorm their requirement. Nowadays many companies are looking forward to hiring freelancer writers for almost all kinds of writing projects from sales copy to website content. Freelance writers are a great help when it comes to assisting clients with small projects like resume writing or updating bio on social media profiles like LinkedIn. There are basically three types of writers in the freelance world; the first type specializes in a particular industry, the second type excels in different kinds of projects, and the third type is a combination of both genres. Every writer’s profile is almost similar, but they certainly fall under any one of these categories. Did you know content writing is not the only prime focus of writers at Vulpith? A content writer is expected to write a compelling copy, but they mostly deal with blogs, articles, eBooks, and whitepapers. Copywriters are more inclined towards preparing ad copies and have extensive experience working in advertising companies along with a team of graphic designers and curators. They have a vision of how the result should look with the efforts of the entire team and their individual effort. They produce interesting slogans, one-liners, media campaigns, brand names and everything related to giving a boost to the client’s brand. Sales writers are people who help you hit the gold mine, as they work on projects which need to elevate the conversion rate. It can be, getting more clicks, making consumers curious about the brand to get more calls and finally increasing sales. Creating content for mailers, newsletters, landing pages etc. are the primary skills which fall into this specific category. Digital marketing has earned its place in almost every industry, and many entrepreneurs are aware of the returns of investing in digital marketing. Do you own a business and hate getting engaged with multiple aspects apart from the core purpose of your business? Isn’t it wise to hire someone instead of yourself looking after every aspect of a business? This is where freelance digital marketers become your saviors in the long run. One thing which you should never forget about digital marketing is that it is a continuous process and every level matters just like the beginning. So, it needs a person who is a specialist in handling multiple digital marketing tasks at a time on a long-term basis. The primary tasks of digital marketers include handling Google AdWords account, social media accounts, contributing to making SEO optimized websites and content marketing. Exceptional PR skills will be an added advantage. There are Google authorized certifications for most of these skills, and you need to analyze their profile on Vulpith for the same. Scenario 1 - Your brand may have an average performing website but a strong social media presence. Look for someone who is an SEO and AdWords specialist by filtering the available freelancers to keep away the social media experts. Scenario 2 - This is a precisely an opposite scenario where you need to plan digital marketing from the scratch, and here we recommend you go for someone who is a jack of all trades in this industry. Or simply hire different experts for different areas, but usually, it is feasible to connect with a single person as he/she will have a clear idea about the problems in each area. Note - If you follow these steps you can predict the possible return on investment at an early stage. Hiring a web developer can be critical as this person creates the most important part of your brand’s online presence. A website is one of the easiest ways to get in touch with your target audience to tell them about your business. It is essential to know specific ground rules while hiring the right website developer rather than risking your business. It is crucial to know the developer through the ability to work in different kinds of projects rather than the years of work experience. For instance, a startup will need a self-starter, who is enthusiastic about taking risks, but an established firm may not need these qualities as they have provisions for possible risks. Hence, the need for a web developer varies according to the size of the project or company. Even if you think that you have identified your ideal candidate, you should offer a more straightforward project in the beginning. When you are working with a developer for the first time, it is essential to observe the capability of the person before trusting him/her for complex projects. This will help you understand the way they plan the project and their dedication towards the work. You will also get to know if they take complete ownership of the work assigned to them. Be the freelancer you are hiring is for content writing or contract/agreement writing or for developing a new website or new mobile app, can be anything. You not only need to hire the person with right skill set but also with acceptable domain knowledge and very good attitude. We strongly recommend you focus more on the attitude of the freelancer since this is the major issue in working with professionals. 4. Avoid asking trivial questions related to programming The information related to the field may sound important, but unnecessary to determine the efficiency of a developer. Asking a developer about the creator of Java will not help you understand if he/she is the right fit for your work. Instead, try asking some open-ended questions like how they handle a complicated situation in the middle of the project, or which design patterns do they follow for a project. Note - Take enough time to choose the right person, and you can also hire our Hiring Specialist to help you choose the potential freelancer. Defining what you want and recognizing the exact skill set that will be needed to complete the project is very crucial. You need to have a vague idea about essential components of a mobile app development project which includes, mobile programming languages; hybrid mobile apps and other technical knowledge required. Social media is essential and it is high time that we get over the traditional marketing techniques. Hence this is one of the prime qualities that you need to check in a freelancer in this field. Ask them how frequently they operate their social media accounts or write a blog about marketing. This shows their passion towards work and the interest to stay updated. Most of the times companies believe that you must spend more to earn more, and this isn’t true in many cases. There are two possibilities; you might either make money or incur some loss. Hence it is important to measure what you spend and the ROI that you get. This is an outstanding quality that you need check in a professional marketer as it is an indication of knowledge, skills, and ideas. It is essential to know the opinion about the target audience from a professional. It will not only give you an idea of their expertise in the field but also help you in the decision-making process. You can even discuss new tactics to find and convince potential customers and make sure that it works in practice. If you have been running your business for some time and repeating the marketing plans year after year, then it’s time that you connect with a freelancer who can help you by reviewing your marketing activities to ignite your sales. This individual can really see through the issues and give you an appropriate solution. It is possible that the freelancer can really help you with investing in right strategies, which will work. There are chances that you have been spending enough money on marketing, but you never got the expected ROI because of lack of research. Practical decisions are made based on deep market research where they figure out strategies of your actual competitors to fill in the gaps of your existing marketing plans. If you have a great in-house team, but in the scenario of a crisis; you may feel like having a helping hand to minimize the damage. Here you can consult a freelance marketing expert. This service can be availed on an hourly basis and you can get your marketing on the right track. For this purpose, you will need an experienced individual to fulfill your requirement.